Do we value the London Congestion Charge? It may have gone unnoticed to many, but the London Assembly recently sought ideas on how to tackle congestion in the capital. One of the submissions from the London Chamber of Commerce and Industry (LCCI) calls for a radical rethink on the congestion charge and questions whether it is serving the purpose for which it was intended. Although, contrary to some media reports, the LCCI submission does not advocate ‘ripping up’ the congestion charge, any hint of of removing the one congestion pricing system that has been successfully implemented in the UK will cause dismay amongst most economists. Congestion charging is, at least theoretically, an economically optimal way to reduce congestion, even if implementation can be practically and politically challenging. Greater use of road pricing was one of the policies advocated by the recent LSE Growth Commission report on transport infrastructure. Of course there are many debates about how effective the London congestion charge has been in reducing congestion and at increasing the wellbeing of the capital’s residents. Surprisingly though, there is little rigorous empirical evidence on the question. My recent research on the congestion charge addresses this gap by estimating the impact of the introduction of the charge and subsequent price hikes on traffic flows, and the consequent effects this had on house prices in the area – house prices being a useful metric of how much residents value the changes. The headline finding is that the original congestion charge and the short-lived Western Extension reduced traffic. Homeowners valued these better traffic conditions in the western extension of the zone, where prices rose by around 4% when the congestion charge was implemented. 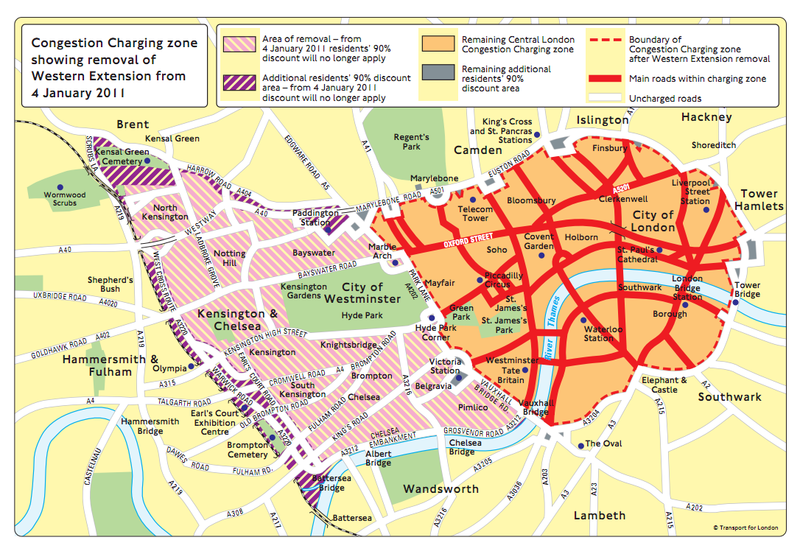 On the 17th of February 2003, London introduced the Congestion Charge Zone (CCZ) in Central London. A flat fee of £5.00 was levied on commuters driving into the zone between 7:00am to 6:30pm from Monday to Friday, excluding public holidays. The demarcated charge zone covered a total of 21 square kilometres and encompassed the financial centre (Bank), parliament and government offices (Palace of Westminster), major shopping belts (Oxford Circus) and tourist attractions (Trafalgar Square, Westminster Abbey, Big Ben, St Paul Cathedral) (See Map below). These are areas with the heaviest traffic flow. The rationale for the charge is not only to mitigate traffic bottlenecks and improve traffic flow and commuting time, but also to generate revenues to improve the public transport system. Is the charge effective? My research show that indeed it is. Relying on traffic data at a road level, I find that vehicular flow fell by 6% to 9% after the CC is first introduced in 2003, and 4% to 6% when the WEZ is implemented in 2007. Subsequent hikes, other than the initial increase in charge in 2005 (from £5.00 to £8.00), has a less discernible impact on traffic. This is understandable as marginal increases in the charge are less likely to dissuade drivers from commuting into the zone than its introduction. Commuters are now required to pay £11.50 to drive into the cordoned area when the CC is up. With less driving in the CCZ, air quality has also improved, according to others’ research. The implementation of the CC was associated with a 12 per cent reduction in air pollutants as such PM10 (Particulate Matter) and NO (Nitrogen Oxide) in the zone (Beevers et al. 2005). Roads are also much safer with a decline in accident and casualty counts (Green et al, 2016). 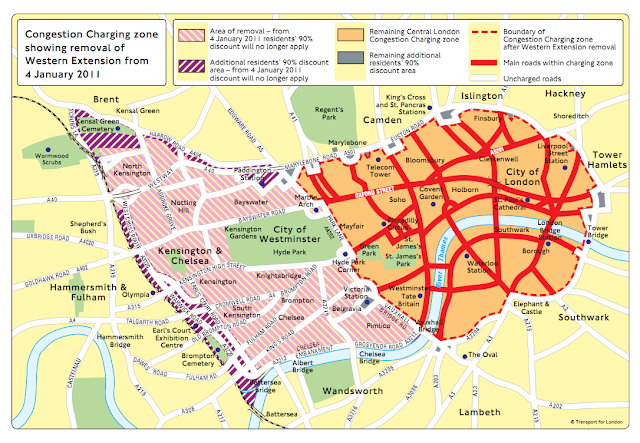 The success of the original congestion charge led to the subsequent extension of the congestion charge zone to central west London (WEZ) in 2007 that covers Kensington and Chelsea borough - one of the most expensive and sought after estates in London. How much do residents value these benefits? So do homeowners pay for these benefits? To examine this, I restrict the analysis to properties very close to the congestion charge boundary (within 1 kilometre) to exploit the sharp discontinuity in traffic flow induced by the charge between roads just inside the zone and roads just outside (as drivers are deterred from driving into Central London). This ensures that properties in and out of the charged zone are almost similar other than being affected by the charge (or receiving the benefits from improved traffic conditions). Comparing house price changes before and after the CC is implemented, my findings show that homeowners do pay for these benefits. When the WEZ was implemented, house prices rose by 4 per cent (about £30,000) relative to comparable transactions outside the zone. However, similar price increases did not occur in the original CCZ when it was introduced in 2003. There are several reasons for this. The initial introduction of the CC was not well-received by the residents. Many were unsure whether the charge was able to achieve its intended aims. Furthermore, based on census data, residents in the WEZ are more likely to own a car and drive more to work, stay further away from their workplace and earn much higher wages. All these factors could explain a larger willingness to pay to avoid traffic congestion. My findings show the effectiveness of the congestion charge and that homeowners appreciate these benefits by paying more for homes in the zone. Despite the success associated with the charge, it still faces vehement opposition from the public, who perceive it is as an extra tax. As a result, few cities are able to implement the charge, despite high levels of congestion. Some exceptions include Singapore, Stockholm, Gothenburg, Milan and Dubai. Having said that, for the charge to achieve its intended aims, drivers must be provided with a reliable public transport system to induce them to switch from driving. Beevers, Sean D, & Carslaw, David C. 2005. The impact of congestion charging on vehicle emissions in London. Atmospheric Environment, 39(1), 1–5. Green, Colin P, Heywood, John S, & Navarro, Maria. 2016. Traffic accidents and the London congestion charge. Journal of Public Economics, 133, 11–22. The RICS recently called for a big boost to building houses specifically for rent because, they claimed, there will be an additional 1.8 million households looking for rental property by 2020. This misses the point and will not address the causes of our housing crisis. Our problem is not a shortage of rental housing; it is a shortage of housing - full stop. All houses are owned and occupied, vacant or rented and renting is a substitute for owning. As a result in the long run rents and prices tend to move more or less in step for a given type of house. But we have not only a shortage of houses but an unbalanced offer of houses. They are on average too small, not well enough designed or built, and in the wrong locations. That is cramped houses in places people do not really want to live. But because there is such a shortage both prices and rents have been rising consistently in real terms for two generations. My LSE SERC colleagues and I have been generating the evidence of this shortage and identifying its causes for years now (see here, here, here or here). The uncomfortable reality is that the total unfitness for purpose of Britain’s planning system and how that interacts with our system of local taxes, seriously restricts the supply of new housing. This reality is somehow too disconcerting to confront. Politicians offer magic wands to build 1 million homes by 2020 or 55,000 a year in London but deliver no mechanisms to achieve it. They know that politically they cannot say they do not want to build more houses but they feel incapable of tackling the vested interests benefiting from both the causes of our desperate housing shortage and its results. In 2014 my reasonably informed estimate was that the accumulated house building shortfall in the 19 years to 2012 was between 1.6 and 2.3 million homes. The problem is long term, not short term. We should not be London-centric but to illustrate with London: we were building around 75 to 80,000 houses a year in the GLA area in the 1930s; nearly 30,000 a year even in the 1870s. But since 1980 house building in London has only occasionally reached 20,000 a year. The only effect of raising ‘targets’ since 2000 – up progressively from 14,330 to now 55,000 – has been to increase the shortfall between promise and achievement. And given his policies Sadiq Khan will be no more successful at delivering on his targets than Boris Johnson was on his. House prices have roughly doubled in real terms in every decade since the 1950 and since 2005 have risen by 47.4% But over this more recent period rents ‘only’ rose by 18.4%. This is not a ‘long period’ – the one in which we are all dead – but still the close link between prices and rents seems to have weakened. Houses are a peculiar form of ‘good’ because they perform two functions at once. They provide a flow of housing services; they are places to live. But they are also investment assets. In a world of stable prices a sensible person would choose whether to own or rent on the basis of their circumstances and preferences. They might be young and mobile so want not to have the fixed costs of ownership. Their hobby might be do-it-yourself so they would want their own house to perfect. They might be scholars or inveterate travellers who did not want the ties of home ownership. From the investors’ point of view they might want something like a ‘bond’: a safe and secure asset, albeit not very liquid, providing a more or less guaranteed flow of income in the form of rents. This world of stable real house prices is not an economist’s fiction. It is more or less the situation in Germany or Switzerland. Those countries have pretty sensible planning and local tax systems and they build enough houses to satisfy demand. Britain is, of course, different. We have a dysfunctional planning system and an almost equally dysfunctional system of taxes when it comes to land and housing. So both housing but even more land to build houses on, are in short supply and have been in increasingly short supply since we started to ration space by imposing Green Belts in 1955. Getting permission to build houses on a hectare of farmland on the northern fringes of London would increase its price from perhaps £20,000 to £12 to 15m: a clear signal of the loss of value imposed by not letting more people live where they really want to and could be most productive. So if you live in a world planned on British (as opposed to German or Swiss) foundations, a world in which the real price of houses nearly doubles in every decade, then of course you have a big incentive to be a home owner. Miss out at 25 and you risk permanent exclusion from the housing wealth ladder provided by our ever rising house prices. Home ownership as a tenure steadily rose from 32% in 1953 to around 70% in the early 2000s, but has now dropped back to less than 64%. For people born in the 1950s the homeownership rate nudged above 70% before they got to 34; in the past 12 years, however, homeownership rates for the under 34s have fallen from 59% to 34%. Younger people have been priced out of ownership, even become YIMBYs. This pricing out of ownership partly results from the ever rising price of houses relative to incomes but low interest rates have significantly offset that hurdle since 2007 because the annual mortgage payments fell with falling rates. The growing hurdle for the young would-be home owner has just been getting a deposit together; especially in the face of competition – prices have after all risen relative to rents – from the fortunate cohorts born in the 1950s or 1960s withdrawing equity to get a buy-to-let as a pension. The median landlord only owns one rental property but given what has happened to returns on other assets, if you want a bit of income, letting out has become seriously attractive. So would-be owner occupiers have been squeezed out by wannabe landlords whose incentive is the extraordinary low returns on those assets normally financing pensions and the capital gains they have made and expect to make from owning homes in a market like Britain’s. This pushes up house prices but increases the supply of rental stock. The problem is that unless we really step up house building all we do is redistribute an almost fixed stock between alternative buyers: buy-to-let landlords or owner occupiers or just a few second home owners – British or foreign – who do not occupy their houses very much. We do not need to build more rental stock; we need to build more homes.